Winter months in the midwest obviously come with the chance of snow. If you were anywhere near St. Louis the past few days, then you probably experience more than your fair share of snow. Shoveling snow is great physical activity, and can actually be a decent workout on days when you can't get out to drive to the gym. However, I've seen more than my fair share of patients who have hurt their back when out shoveling snow. Use the tips below to help make sure you keep your back safe this winter! Avoid Twisting - When tossing snow, take steps and move your whole body. The joints in your low back are designed to bend forward and backward, not to twist. Large twisting motions, especially when carrying a load, put your low back at risk for injury. Bend your knees - use your legs to help you lift the snow. Choke up on the shovel - using one hand close to the head of the shovel will help you to support the weight of the snow better than keeping your hand on the middle of the shaft of the shovel. Take Shortcuts - instead of shoveling along the long length of the driveway, go across the width of it. This way you can follow tip #5 below. Plow, Don't Lift - If you don't have to lift snow, don't. If you can just push the snow along the width of the driveway, it saves you the trouble of having to follow tips 1-3 above. Wear Gloves - Your fingers and toes have the largest surface area to volume ratio in your body, so these are the things that will get coldest first. Wear gloves when shoveling, even if its not that cold, to protect yourself from frostbite. Mittens work even better than gloves, because they further decrease the exposed surface area. Rest As Needed - If you've got a really long driveway, or if you're not in the best physical condition, don't get yourself exhausted. You are most likely to get injured when you are tired. Take a break if needed, and come back to finish the job when you are rested. Stay Hydrated - Your cells are mostly made up of water, so you will function at your best if you stay hydrated. Warm up with some coffee, tea, or hot chocolate, or at the very least, drink some water. Use the tips above when shoveling this winter to help keep your back safe. Do You Have Back Pain Already? Download the FREE Tips E-Book below or check out our Back Pain Page for more information. 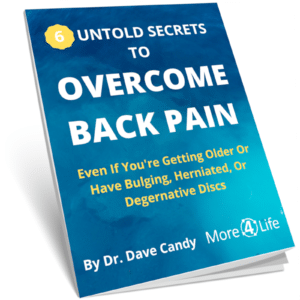 This FREE guide shows you simple tips and tricks you can use in your everyday life to help ease back pain without pain medication, injections, or even a trip to the doctor's office.